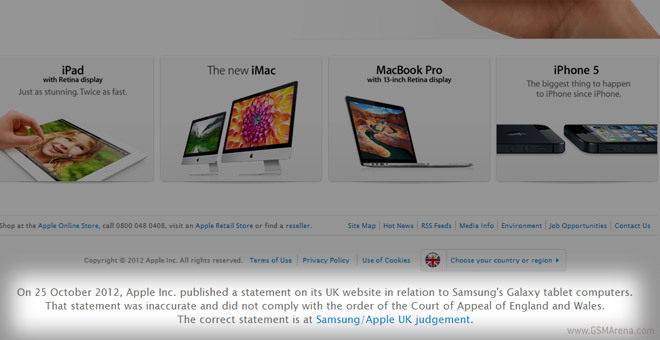 Just as the UK Court ordered, Apple has now put a proper statement on the bottom of its UK homepage saying (in exactly 11pt font) that the previous statement didn’t comply with the order the court had issued. There’s also a link which takes you to the new page, where Apple states that the Samsung Galaxy Tab 10.1, Tab 8.9 and Tab 7.7 didn’t infringe on Apple’s design patents. This time, Apple isn’t beating around the bush like the first time, when the company published a text acknowledging UK Court’s decision, but also mentioning that the German and US courts sided with Apple. According to the UK Court’s ruling, the text should stay on Apple’s UK frontpage for 14 days. The company already started publishing the Court’s ruling in newspaper and magazine advertisements. Thanks for the tip, Gab!